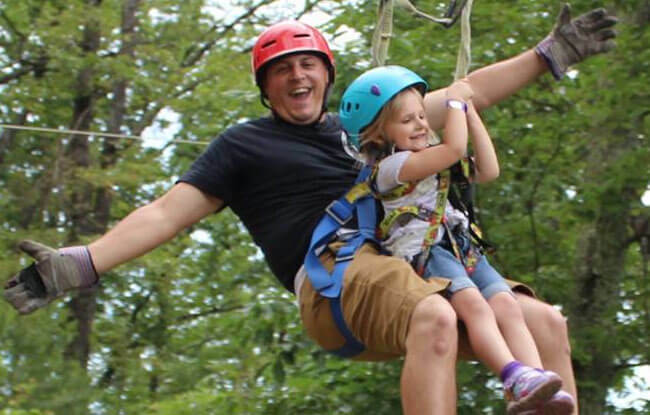 Legacy Mountain has an impressive zipline course, and I managed to get the whole family on it, from my 4-year old daughter to my mother (who is terrified of roller coasters and wouldn’t even get on Dollywood’s Firechaser Express). 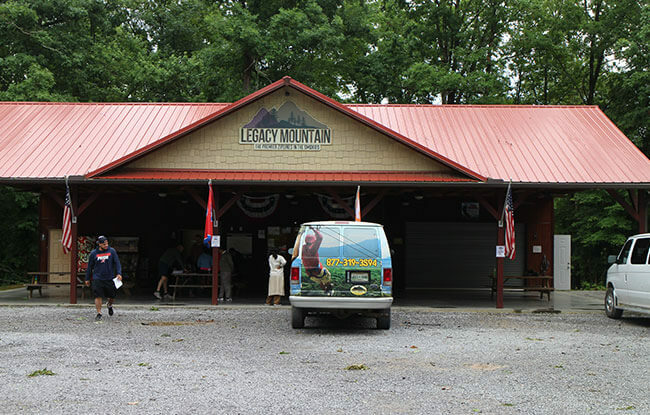 I chose Legacy Mountain for their zipline course because they allow kids as young as three to participate. In fact, when we were finished, we likely convinced a parent of a toddler to bring him along. You’ll also be able to feast your eyes on the captivating scenic and panoramic views. When we first arrived about a half hour before 9 a.m. we were told that we had to wait due to some branches that fell across the roads to the lines. (I’d recommend arriving early so you can fill out the waiver, get weighed, and use the restroom.) While it was postponed an hour, I’m glad we had to wait. We took some time to visit Alewine Pottery (you pass the Glades area on the way to Legacy Mountain) and purchase a lovely new mug. We also noticed the weather had cleared to the point that there was no dread of zipping through the rain. The sun poked out, and we were able to zip with great weather! After we had got the green light to suit up, we all got into our harnesses and put on our gloves and helmets. Our guides, James Karrow (who goes by Karrow since there is another James that works at Legacy Mountain) and Zack, made sure everything was fitted securely. Then we got into a van and headed up the mountain and past the Legacy Mountain Resort Cabins, which were gorgeous with scenic views. Our first stop was where we got our training and safety briefing. We learned how to control our direction, how to brake, and most importantly—to trust our equipment. We also learned hand signals from the guides that indicated when we needed to slow down. We went to the zip station nearby where we tested our knowledge. It wasn’t long or far off the ground and was mostly straight across, but it was a good way to get a feeling for everything and to build confidence. My daughter, Mira, was able to do this line completely by herself. We were all grateful that Legacy Mountain has a two-line system for added safety. It was impressive to discover that about 90% of the course equipment was made in Knoxville and Wears Valley! 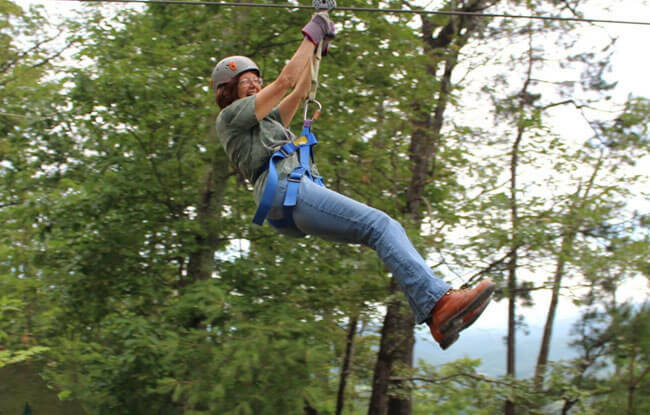 The second zipline was much more intense and offered some views of the mountains. Mira got to solo that line as well, loving every minute of it. We took an off-road vehicle up to do the last four lines, which were much higher up on the mountain. Some of the people in our party were a little nervous. One girl wasn’t sure about going by herself, so Karrow offered to have her go with him down a few of the lines with him. Mira was able to do the line with my husband as he showed that he could handle braking. There’s a reason why you need to be in decent shape to handle these ziplines. The larger lines had a mix of walking, climbing, and driving to get to them. I’d recommend a comfortable and supportive shoe. Some of the walking trail was very steep and exerting, but they did provide bottles of water along the way so we could keep ourselves hydrated. On the sixth line, they took our group photo and also pictures of us on the line. By this time, most of us were confident enough to let go of the line for a smile. I couldn’t believe my mom even did it! Ziplining was an experience that I’ll always remember. It was very safe, and I felt secure. Now if I could only convince my mom to try roller coasters! Find more exciting things to do in Gatlinburg.